The organs of a plant serving sexual reproduction are flowers. Their final product is seed. A flower is a rather complex structure formed by the flower axis that is usually transformed into the receptacle and the perianth. The perianth consists of calyx and corolla. The calyx is made up by he sepals, the corolla by the petals, stamens and carpels. If calyx and corolla cannot be distinguished or if the calyx is missing, it is spoken of an incomplete flower or perigon. The androecium is the totality of the male reproductive organs. It comprises the stamens. Each stamen consists of a filament and an anther. The female reproductive organs, the gynoecium, include the carpels. Carpels are structures that are made up from an ovary and a stigma and that contain one or more ovules. One or more carpels may be combined to a pistil (ovary, style, stigma), the gynoecium as a whole. 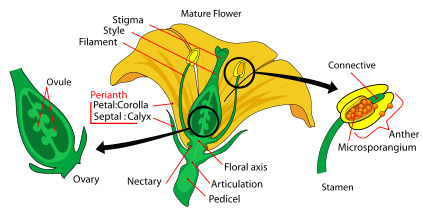 Taxonomical flower features are the flower symmetry, the way in which the carpels are fused and the resulting position of the ovules, also called placentation, and the position of the ovary. Flowers that contain both androecium and gynoecium are called androgynous or hermaphroditic. If both male and female flowers live on one plant it is called monoecious. Plants with male and female flowers borne on separate plants are termed dioecious.